2008 Suzuki Boulevard C50. Picture credits - Suzuki. Submit more pictures. The Boulevard C50 has the soul of a classic cruiser combined with V-twin performance that gives you a charge every time you twist the throttle. The Boulevard C50�s classic design begins with the flowing lines of its kicked-out front end and pullback handlebars, which perfectly complement its teardrop tank, stepped seat and boldly valanced rear fender. 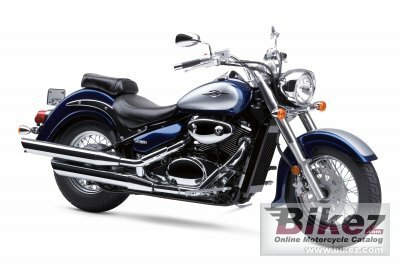 Ask questions Join the 08 Suzuki Boulevard C50 discussion group or the general Suzuki discussion group. Bikez has discussion forums for every bike. View comments, questions and answers at the 2008 Suzuki Boulevard C50 discussion group. You can sign up for e-mail notifications when other riders answer you. If you have extensive experience with the MC, please send us a review. If you consider buying this bike, you should view the list of related motorbikes Look at photos. Compare technical specs. And check out the rating of the bike's engine performance, reliability, repair costs, etc. You can compare the rating with other bikes.